Basin Pond’s trails lead visitors across streams and cascades through a boulder-strewn natural amphitheater to a beaver pond and the site of two long-gone man-made dams. 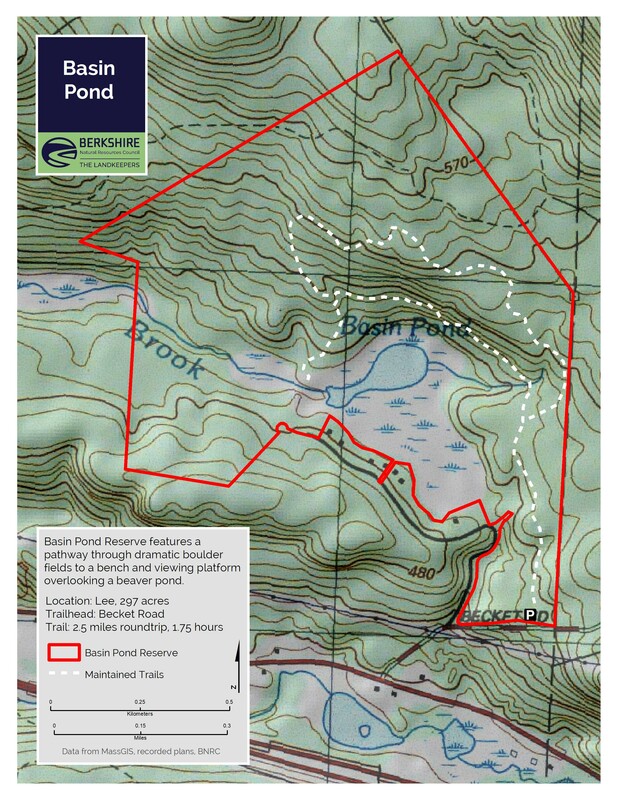 Hikers today can enjoy Basin Pond’s 296 acres by taking the loop trail or walking the more direct route to the pond via the lower trail. Special features: Beautiful wetlands, with a wildlife viewing deck in the sun. 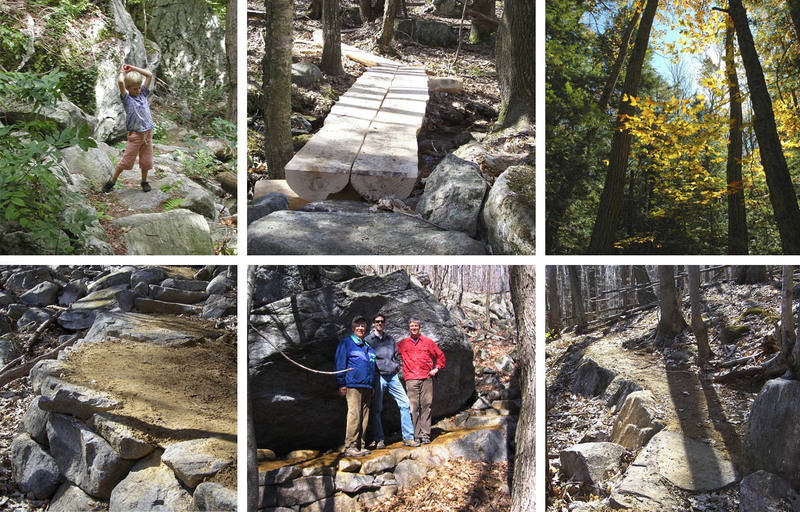 Trail crosses a boulder field which provides a great place for kids to climb and hide on trailside rocks. From Lee: Take Route 20 east past the Outlets. After approximately 4 miles turn left onto Becket Road. Parking will be on your left after a third of a mile. From Great Barrington: Take Route 7 north into Stockbridge. Turn onto Route 102 heading east into Lee. After passing Big Y, turn right onto Route 20 heading east. After approximately 4 miles turn right onto Becket Road. Parking will be on your left after a third of a mile. From Pittsfield: Take Route 20 south into Lee. From Lee, stay on Route 20 heading east, past the Mass Pike toward Becket. After approximately 4 miles turn left onto Becket Road. Parking will be on your left after a third of a mile. From the kiosk, the trail takes hikers on an easy ramble over rolling ground to a cascading stream. Just after the stream crossing, the trail splits. The right fork rises higher on the slope while the left fork takes a shorter route with less elevation gain. Neither path requires much exertion. The two trails converge at a short spur leading to what remains of the 1965 dam. A viewing platform there offers a safe perspective on those ruins and the pond that beavers have created. 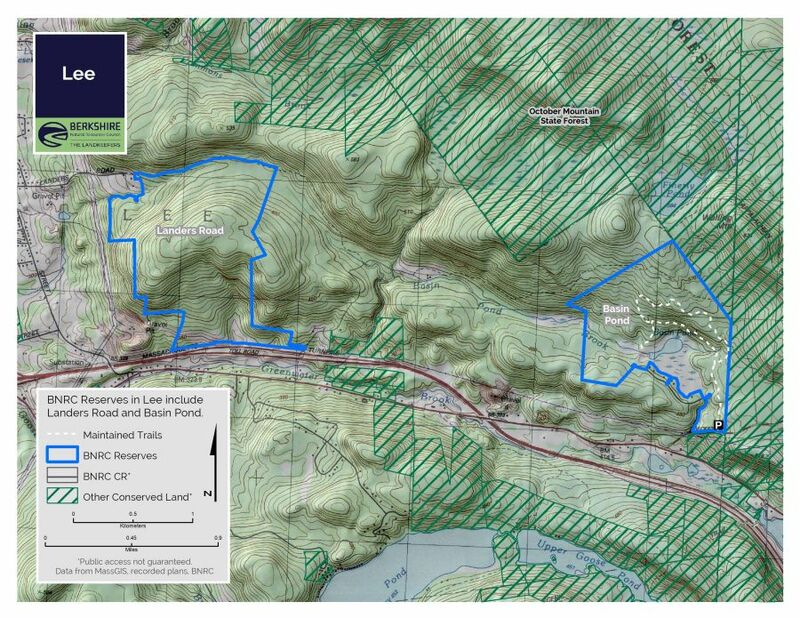 A round-trip of the trail is about 2.5 miles and takes about an hour and 45 minutes. Not far from the bustle of one of the busiest intersections in Berkshire County – the confluence of the Lee Prime Outlets and the Massachusetts Turnpike – lies a 296-acre refuge from the high-speed world. In 1873 East Lee mill owners built a dam at the pond outlet to provide a steady water supply for their manufacturing. Thirteen years later on April 20, 1886 the dam let go, destroying 25 mills and many homes and killing seven people. Described in one history book published shortly after the incident as the “Complete and Terrible Disaster at East Lee,” the deaths led to an inquest, but in the end no one could figure out which manufacturer had contributed to the dam’s construction. Fast forward almost 100 years. The second dam was built in 1965 by two developers who formed the Cromwell-Wright Company to create a resort community that was heavily marketed in the 1960s as the “Lee Colony on the Lake.” This lake (now called LakeLee) was to be the magnet for a 100-lot leisure home development. Three years later, on March 24, 1968, the middle of the 25 foot earthen dam suddenly collapsed, cascading 12 million gallons of water down Greenwater Brook, killing two people in their Cape Street homes, and causing millions of dollars of damage. In the three years before the disaster, 15 lots were sold, and ten residences now border the south side of the wetland. Cromwell and Wright wrote in 1966 that their resort development would be “an investment for generations of happiness in unspoiled America.” This proved not to be the case. 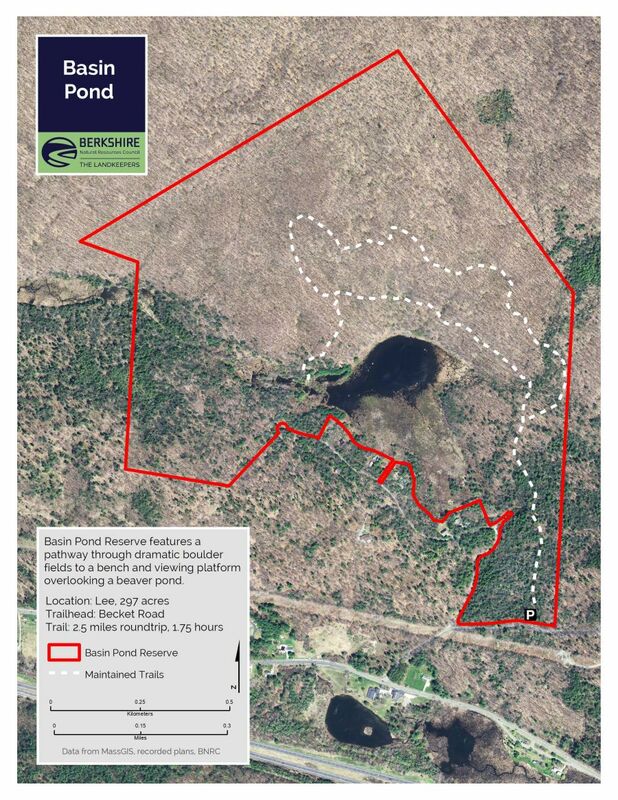 Now, thanks to N. Robert Thieriot, who purchased the property in 1992 and bequeathed it to Berkshire Natural Resources Council, Basin Pond is conserved forever. It provides habitat for a wide variety of wildlife and a place where visitors can take in the grandeur of its “just plain exquisite” (George Wislocki) natural amphitheater. The boulders strewn about the site were deposited by glaciers. Basin Pond’s watery habitat attracts moose and beaver. In part because the property abuts October Mountain State Forest, with 16,500 acres the largest in the state, much other wildlife can be seen, including hermit thrushes. Hemlocks, oaks and other hardwood trees provide abundant shade, while hobble bush is common in the undergrowth. A striking feature of the site is the lacework of streams, large and small, that course down the south-facing hillside.